Histopathology, bacteriology, virology, parasitology and mycology can be appropriate for small sample numbers of some of the common, easily cultured pathogens, however, for many pathogens this can be an expensive, time-consuming procedure, and may not lead to a definitive diagnosis being made. Immunological methods such as immunohistochemistry (IHC) and the indirect immunofluorescent antibody test (IFAT) enable rapid specific detection of pathogens in tissue samples without the need to first isolate the pathogen. ADL produces a wide range of specific probes (AquaMab-P) that are supplied with standard operating procedures (SOPs) to apply these in immunohistochemistry (IHC). 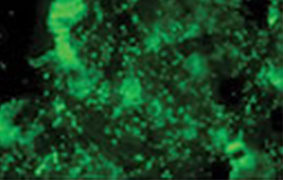 These products can also be used in the indirect immunofluorescence antibody test (IFAT). 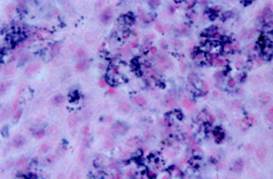 Detection of Renibacterium salmoninarum by IHC and IFAT.